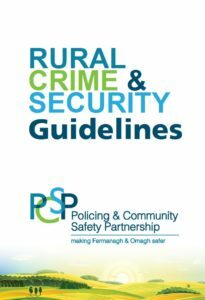 Although the level of rural crime is relatively low, rural crime is not simply a scaled down version of urban crime. 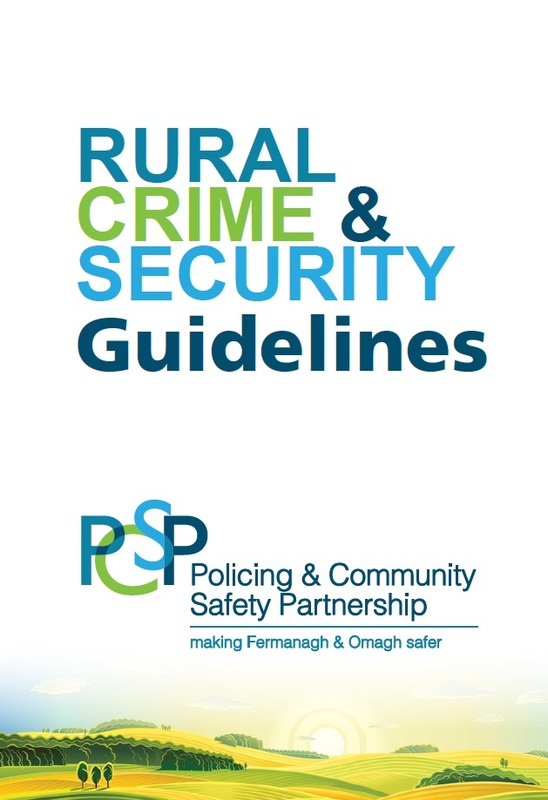 The main differences are the nature of the target of rural crime – for instance, plant and machinery in remote areas – and the lack of resources to deal with the nature of rural crime. Make your plant and equipment less attractive to thieves by making it more distinctive. Use livery stickers or paint your plant and equipment in corporate colours. Consider installing an alarm in vulnerable areas. An alarm will emit an audible warning and CCTV will provide surveillance on places out of view of the farmhouse. Illuminate areas which are overlooked from the dwelling or covered by CCTV. Don’t ignore suspicious or unusual activity. Always call 999 if a crime is in progress or there is a threat to life. Keep expensive machinery and vehicles out of sight. The theft of plant and machinery and equipment has long been an issue for farmers. In recent years there has also been a significant rise in the theft of livestock, oil and metal. With farm businesses often spread over a number of out farms protecting against farm theft can be difficult. The Fermanagh and Omagh PCSP in conjunction with the PSNI host a number of trailer marking events throughout the district. This service is free and events will be notified through local media. Property marking not only identifies items belonging to you but it also acts as a deterrent and can help police identify recovered items. Some of these markings are obvious, some are invisible or hidden. They range from simple ultra violet pens to etching and engraving, as well as many varied commercial products and schemes. Property that is clearly and obviously marked is less attractive to a thief as it is more difficult to sell. Permanently mark all your property and also keep an inventory of each item, including description, value, make, model, serial number etc. and the nature of any security marking. This can also be useful if you need to make an insurance claim following theft or damage. Stencil your ID code and registration number on your farm vehicles. Use heavy duty etching or stencilling to write your postcode and house number on your property. Permanent heavy duty marking can be done with a welder or grinder. Etching or engraving can be done underneath machinery or in areas which may become mud splattered and so remain hidden. A permanent marker can be used to mark smaller items of equipment. A soldering iron is effective for marking on plastic areas of machinery. Consider fitting a tracking device to your vehicle. The PSNI Crime Prevention Officer or your insurance company can advise on suitable products. However you decide to mark your property the post code system of property marking is particularly recommended. It is possible to deliver a letter using only a house number and the correct postcode, therefore, by using the same principles it is possible to locate the owner of property, if that property is marked using the owner’s house number and postcode. Adding the owner’s initials makes it even more traceable to the individual. Take all reasonable steps to mark your property to reduce the likelihood of it being stolen but in the undesirable circumstance that your property is stolen or lost, if it is marked then the chances of it being identified and returned to you are greatly increased. Ultraviolet light assists in the identification of stolen property and in the detection of fraudulent currency, credit cards and documentation. It is used by all law enforcement agencies, and those who handle such items on a regular basis. Property marking is recognised as a major factor in discouraging and detecting crime. Police and commercial organisations are now able to take full advantage of this system to prevent and detect offences. A colourless liquid solution can be applied to your valuable items, including jewellery, ornaments, electrical items and even vehicles. This is forensic marking, the liquid solution gives your property a chemical ‘code’, which is unique to your items and you. It cannot be seen by the naked eye and is very difficult to remove. The solution glows under ultraviolet light, allowing it to be detected. Criminals are aware of forensic marking, they know that it can be used as evidence and forensically link them to a crime, such as theft, robbery and burglary. Regularly check the fields where the stock are grazing; keep the hedges, fences and gates in good repair. Keep all sheds and stockyard gates closed and locked. 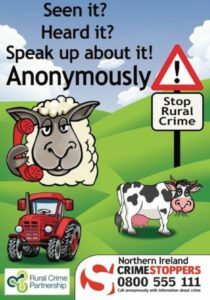 Check your livestock regularly – if livestock are making more noise than usual – check the field to see if anyone is with, or disturbing them. Use ear tags, horn brands or freeze branding to make your animal more identifiable. Livestock identification must include ear tags as required by current legislation. However identification can also include earmarks, tattooing, freeze branding or microchips (electronic identification). Tattooing is often the cheapest form of permanent identification and is suitable for all breeds of livestock. Take photographs or videos of valuable animals with the brand and/or ear tags clearly visible. Maintain accurate livestock records. Freeze branding is a quick, humane and simple procedure that brands the last three digits of ear tags onto the animal, to protect against theft. The branding of cattle has a long history as a means of identification as well as preventing theft and, whilst hot-branding is no longer legal, the modern method uses branding irons super-cooled with dry ice to remove the pigment from the animal’s skin and hair. Freeze branding is the only visible deterrent for thieves and this is borne out by the fact that when cattle thefts do occur, thieves will take unmarked cattle in preference to those which are marked. The freeze branding of dairy cattle for identification purposes is increasingly common in the industry. The value of scrap metal continues to fluctuate. Its lack of traceability has made it an attractive commodity for thieves. Dispose of scrap metal regularly and legitimately to make your premises less vulnerable to thieves. If you are approached by opportunistic ‘scrap dealers’ tell them you have a contract with a legitimate scrap dealer and ask them to leave. With the cost of fuel increasing again diesel and heating oil are increasingly an attractive target for thieves. Store fuel in a secure tank within a compound or shed and use good quality locks. Do not site storage tanks in isolated areas such as outlying buildings. Consider the use of ‘diesel dye’ that makes diesel traceable and less attractive to thieves. Consider using a mobile bowser that could be moved to a more secure location when not in use. Do not drive agricultural vehicles on the road unless they are properly maintained and safe. Fix defects as soon as possible. Take your time and never rush whilst operating agricultural vehicles. Responsible driving is critical to the safety of operators who move farm equipment on public roads. Signal at least 30 metres before turning or stopping. Watch out for obstacles and blind spots at all times. Take care with projections such as bale spikes. Remove them or carry them in a safe position, both on and off the road. Remember, other people, particularly children, may be on the road, even when you are not expecting them. Get help if visibility is poor, especially when reversing. Remember to ensure you have an adequate braking system when towing a trailer or have a heavy load. Poor brakes can cause loss of control, jack-knifing or tractor-overturning. When a person reaches 16 years old they can apply for a provisional licence which will include provisional category F entitlement. This allows the person to drive a tractor on the road but only in the course of agricultural operations or travelling to or from a Category F driving test. However, a provisional category F holder is not allowed to travel within 30mph speed limits at any time. Do not encourage other traffic to overtake you by signalling to them at any time.